In Casa Guimera you can discover the fascinating world of the bees and learn about the qualities of honey. You can also find the best selection of artisan cheeses from the area, traditional sausages and a sampling of our typical artisan handicrafts. 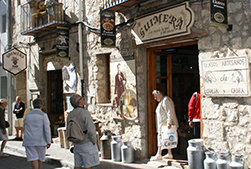 Come to Casa Guimera and take home the best souvenir from Morella. Request information for products not found on the web but are available in the store by using the Contact form.